Cloud computing and APIs are driving a lot of discussion in enterprises. As of April 2011 Programmableweb.com, a directory of online APIs, lists over 2300 APIs in its index. This number is certain to grow. At the same time, online data is more dynamic than it's ever been. The static pools of data that formed the foundation of interactive Web sites are giving way to rivers of dynamic, flowing streams of data in the form of tweets, Facebook updates, SMS messages, and location check-ins. The inherent loose coupling of event-based systems and their resilience in the face of error enables serendipitous interaction and is one of the primary ways to create Web applications that respond dynamically and flexibly to user intent. 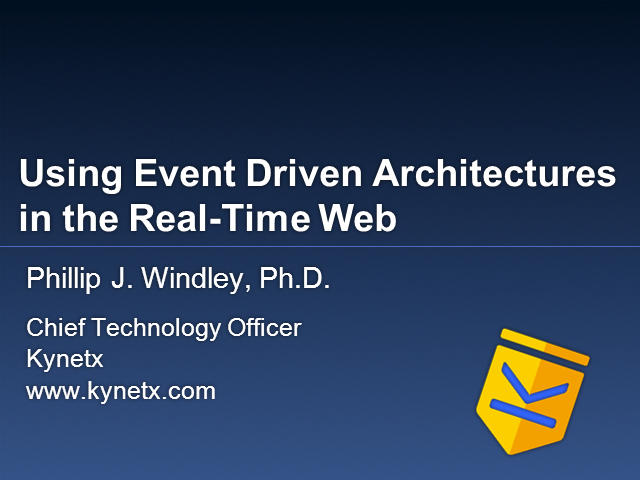 This talk will focus on trends driving online interactions, including APIs and real-time data, and discuss how event-driven architecture can create more loosely coupled, flexible, and responsive systems for interacting with customers.